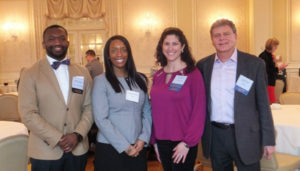 From left: Kelvin Crumby, scholarship committee chair; Nadieghda Mathelier, scholarship recipient; Jamie Vitale, Chapter president; Tom Fezza, director and past president. 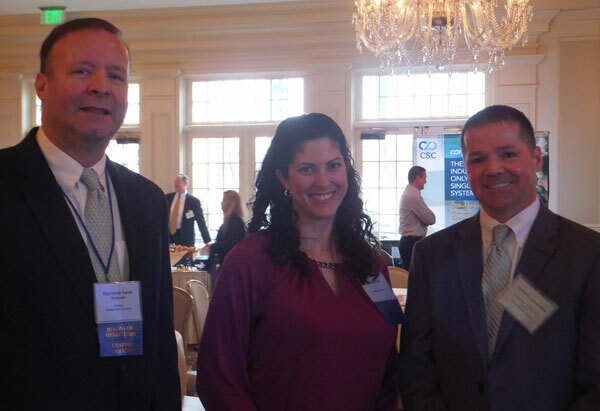 Getting out ahead of the four nor’easters that hit the East Coast in March, TEI’s New Jersey Chapter held its daylong winter seminar on February 23 at Meadow Wood Manor in Randolph, New Jersey. The seminar, sponsored by Ernst & Young LLP (EY), started with a robust plenary session during which six EY partners made presentations on the new tax reform law. EY presenters followed the plenary with sessions on federal, state, and international tax, with a focus on the impact of tax reform in these areas, including tax accounting and financial reporting. Terrence Hendricks, EY’s New Jersey tax practice leader, moderated the plenary session and coordinated the entire program. Using the best experts at the firm on the most current issues facing the Chapter’s members, EY put together a powerful educational program. Other firms that presented included Pepper Hamilton LLP; Sills, Cummis & Gross PC; Economics Partners LLC; CFO Services Group; Buchanan, Ingersoll & Rooney PC; and Global Tax Management. At lunch, the Chapter awarded a scholarship to Nadieghda Mathelier, who is working toward a master’s in taxation at Fairleigh Dickinson University. In addition to putting in long hours of studying, Mathelier is an IRS volunteer income tax assistant. From left: Ray Salort, director and federal committee chair; Jamie Vitale, Chapter president; and Terrence Hendricks, partner and New Jersey tax practice leader, Ernst & Young LLP. Under the leadership of this year’s president, Jamie Vitale, and past president Tom Fezza, who served from 2015 to 2017, the New Jersey Chapter now hosts five all-day seminars, up from three or four in previous years. The Big Four CPA firms continue a rotation for three of the all-day seminars, and EisnerAmper LLP and Grant Thornton LLP each sponsor a special seminar. The Chapter rounded out the fiscal year with a special all-day SALT seminar on April 20, presented by RSM LLP; the Chapter’s Women in Tax group event on May 10; and an all-day seminar on May 11. Finally, the two-day Region II conference took place in Atlantic City on June 4 and 5. We were excited to see members from many chapters who attended this event, which is in its thirteenth consecutive year.